Help Us Reach 30 New Sustaining Donors! Please join us for a week of action for workers’ rights! This Sunday kicks off International Food Workers Week. Then next Tuesday is a Day of Action to urge Walmart to pay up to the victims of the Tazreen factory fire. And Black Friday is the time to show up for justice for Walmart retail workers. November 22-28: International Food Workers Week is held annually during Thanksgiving week to engage the public about the importance of food chain workers and to move people to take action in support of these workers. Visit the Food Chain Workers Alliance (FCWA) for the list of actions and events. 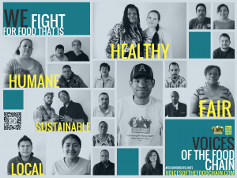 The 2015 week of action also features a special collaboration between FCWA and StoryCorps so workers in our food chains can tell their personal stories. Check them out, and share the stories throughout the week of Thanksgiving to show your thanks to the people who make our food possible! November 24: Three years after the Tazreen factory fire that killed 112 workers, Walmart continues to refuse to make any payments at all to the families of the workers who died sewing its clothes. Please sign up to take action on November 24th by delivering a letter to the store manager at the Walmart near you. If there isn’t a Walmart in your area, sign our petition and follow us on Twitter and Facebook for other online actions. November 27: On Black Friday, the day after Thanksgiving, Walmart workers in the U.S. will fast for $15 an hour and full-time jobs. Show your support by joining the #FastFor15 and showing up to a Walmart store action near you. In D.C., please join ILRF Executive Director Judy Gearhart at the 99 H Street Walmart at 9am. Check out the latest newsletter from our Latin America program to find out what Honduran trade unionists think is behind recent death threats against them, and how ILRF is strategizing with them to fight back. (If you’re in the U.S., please write to your Members of Congress in support of these brave activists.) You’ll also learn what happens next for the labor rights complaint we filed with partners against the government of Peru (a TPP country), what we learned from meeting banana workers standing up for their rights in Central America, and what the leader of COLSIBA – a federation of agricultural unions across eight Latin American countries – talked about in her meetings with members of U.S. Congress last month. Violent retaliation against civil-society monitors reporting on state-led forced labor has risen alarmingly during the 2015 cotton harvest season. Monitors have been arrested, detained and physically assaulted, and have had their homes burned down. In the midst of this crackdown, the International Labour Organization (ILO) is finalizing its report on forced labor during the harvest, which the World Bank will use to determine if it should suspend payments to the Uzbek government for agriculture projects. The Bank committed to suspend funding if there is forced labor in its project areas. The independent civil-society monitors, partners of ILRF in the Cotton Campaign, have documented extensive state-led forced labor in Bank project areas throughout the 2015 harvest. Please join us in asking the ILO and the World Bank to acknowledge the forced labor rife in Uzbekistan, and speak out in defense of civil society monitors. Then stay tuned for our action outside the World Bank on December 10, International Human Rights Day! ILRF was in Malaysia this week to promote the Free and Fair Labor in Palm Oil Production Principles and Implementation Guidelines at the annual gathering of the Roundtable on Sustainable Palm Oil (RSPO). While there, a coalition of labor, human rights and environmental groups joined together to call on the RSPO to adopt the implementation guidance from the Principles into its standards, which the coalition described as too weak to adequately protect exploited workers on palm oil plantations. Eric Gottwald, ILRF’s legal and policy director, presented solutions to a room of more than 30 industry actors, encouraging them to ensure plantations in their supply chains adhere to the Principles. When we reported on H&M’s failure to honor its safety commitment to workers in Bangladesh, the company responded defensively in the media. But after we published our follow-up statement detailing how H&M’s response to our report was replete with false and misleading statements, the company has been surprisingly quiet on the matter. Meanwhile, H&M has been getting a LOT of press about its first South Africa store opening and the “Balmania” that occurred when shoppers went wild at U.S. H&M stores after a celebrity-packed Wall Street launch of the Balmain x H&M collection. We need your help to make sure that the garment workers aren’t forgotten! Today, please share this image on social media and plan ahead to join the Global Day of Action on May 3rd. Today 14 Cambodian unions launched a joint campaign calling for a new garment industry minimum wage of $177/month. Currently garment workers earn a mere $128/month and recently the Cambodian government announced that the wage would increase only by $12/month in 2016. According to the research of Cambodian and international unions, the median consumption expenditure for a single worker is $207/month. Please show your support for Cambodian workers in their campaign toward a living wage by taking action on December 10th, International Human Rights Day. ILRF is pleased to welcome two new staff to our team. Kevin Lin is our new China Program Officer who joined after Emily Boitel headed to grad school this fall. Whitney Pierson started recently as Financial and Operations Assistant. We are currently welcoming applications for spring work-study positions based in Washington, D.C. Thanks to our supporters, we were able to raise over $9,000 as part of a fall fundraising campaign! With ILRF’s 30th birthday coming up next year, we’re looking for 30 new sustaining donors who will give $30 on a monthly basis. So that ILRF starts 2016 stronger than ever, please support our work by becoming a monthly sustainer or making a one-time tax-deductible gift today.